Containers can be used for fresh and silk flower arrangements. 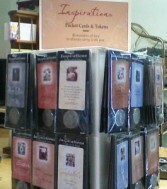 Each token is slightly larger than a quarter, and each card has a short inspirational message. Card is about the size of a credit card and the token is about the size of a quarter. Each card has a picture and message, while token has a matching picture. "You don't have to promise me the moon and the stars Just promise you will stand under them with me"
Stones are 10 to 11 inches in diameter. 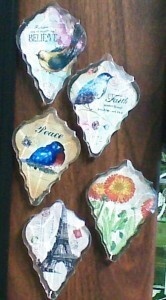 Can be placed outside as a stepping stone or each has a hanger on the back that allows them to be hung on a wall. Additional styles not shown. 10.5 inches by 8.5 inches. 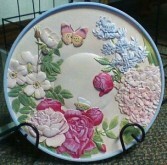 Can be used as a stepping stone or it has a hanger on the back for it to be hung on a wall. 7 inches wide by 11.5 inches tall. 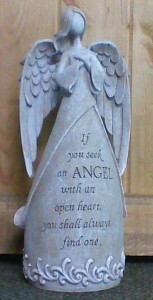 Angel stands about 18 inches tall. Plaque is about 11 inches tall. Garden stand will raise it at least another 4 inches. Etching on bottoms lights with solar power. 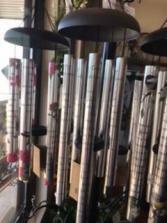 Chimes come in lengths of 18 inches to 44 inches. 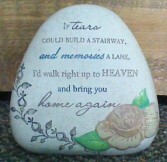 Shown as displayed for funeral home. 5 inches high by 13 inches long. 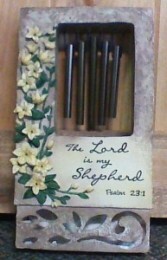 Wind up music box plays Amazing Grace. Place for photo of loved one on the lid. Box is 8x6x3. Candle is run by 2 AA batteries. Has an on off switch or can be set on a timer which allows it to stay on for 6 hours. Candle stands 6 inches tall. approx. 5x5. Made of hard plastic. 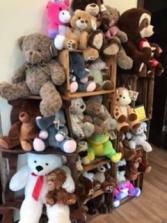 Stuffed dogs, cats, cows, monkeys, lambs, bears, elephants, and giraffes. 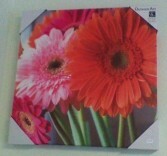 20 inch square. Weatherproof, UV protected, waterproof. Also have Sunflower print. Heart is 3x3. Pick is 10 inches. 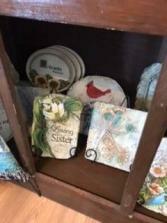 Large selection of tapestry woven throws. 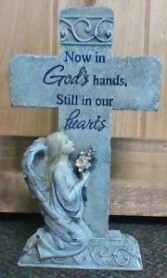 Can be folded ($64.00), or placed on an easel($74.00) for display at local funeral homes. Angel statues in different sizes. Steelers, Pirates and Penguins. Mugs, bears, cups and wind chimes. Flowers convey a message that cannot be put into words. Indiana Floral & Flower Boutique of Indiana, PA provides a variety of fresh, fashionable floral designs to ensure that your gift is one of elegance and beauty. 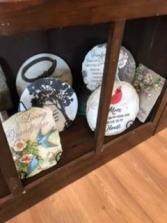 When you're looking for a unique hostess gift, token of appreciation or just a surprise to brighten someone's day, let Indiana Floral & Flower Boutique customize and deliver one of our many fun, decorative & luxury gifts! We create dazzling presentations that are sure to please for any gift-giving occasion. 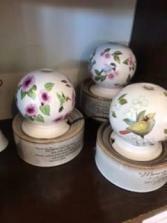 To get your custom gift items, come by and see Indiana Floral & Flower Boutique - your local Indiana, PA florist.